Dorothy Cozart, “A Century of Fundraising Quilts: 1860-1960,” Uncoverings 5 (1984): 41-54. Carolyn Ducey, “Chintz Appliqué Albums: Memory and Meaning in Mid-nineteenth Century Quilts of the Delaware River Valley,” (Ph.D. Dissertation, University of Nebraska-Lincoln, 2010). As women began to organize into formal and informal organizations in the 19th century in order to reach into the public sphere and impact society, they used their traditional sewing skills as part of their efforts to support and raise funds for charitable activities. With the development of early 19th-century church organizations such as Sunday Schools and missionary and Ladies' Aid Societies, these groups sewed clothing and necessities for destitute individuals and sold quilts to provide funds for continuing church projects. Church groups also made quits specifically to raise funds for missionaries stationed in the American West and in countries abroad. 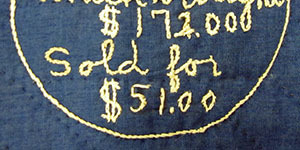 Quilt scholars have identified only a small number of early fundraising quilts. The earliest known quilt intended to raise money is an 1839 silk crib quilt raffled to support the anti-slavery movement. A group of five surviving quilts made in the 1840s by the First Baptist Church of Philadelphia helped supply vital money to missionaries in India and Burma. The Female Relief Society of the North Russell Street Methodist Episcopal Church in Boston made a red and white quilt as part of their charitable activities. The rarity of surviving examples of fundraiser quilts and the scarcity of their mention in contemporary newspapers indicates that the practice was not widespread before the Civil War, but developed rapidly during the conflict, when supporters of both the Union and Confederacy sewed blankets, bandages, and quilts to support the war effort. Afterward, as the country rebuilt, fundraising quilts became a significant support for new church buildings and furnishings. In the late 1870s and 1880s, fundraising quilts became a staple of women’s organizations, helping to raise money for social causes. As the century progressed the money raised by women’s sewing projects became increasingly vital to churches' success. Women’s organizations infused church coffers with large amounts of cash that was spent on materials for new churches and buildings, repairs, salaries and education. Quilts made by these organizations typically feature names embroidered onto a white ground; individuals paid a small donation to have their name inscribed, with individual quilts raising from $25 to $100.